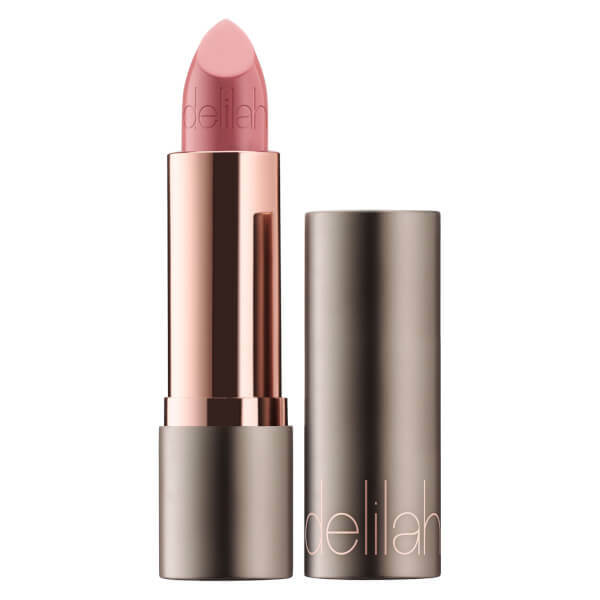 Douse your lips in rich colour with delilah Colour Intense Cream Lipstick, a luxurious lip colour with soft, creamy feel and silky-matt finish. Gliding effortlessly across lips, the creamy lipstick delivers highly pigmented colour and is infused with spherical polymers and Vitamin E for a velvety feel and antioxidant protection. Soft and creamy, the long-lasting lipstick feels comfortable on application and melts beautifully onto lips. Caprylic/ Capric Triglyceride, Pentaerythrityl Tetraisostearate, Isononyl Isononanoate, Polyethylene, Dicalcium Phosphate, Candelilla Cera, Cera Microcristallina, Nylon-12, Silica Dimethyl Silyate, Cera Alba, Disteardimonium Hectorite, 1,2-Hexanediol, Caprylyl Glycol, Tocopheryl Acetate, Pentaerythrityl Tetra-Di-T-Butyl Hydroxyhydrocinnamate, Sodium Saccharin, Mica, Tropolone, +, CI 77891 (Titanium Dioxide), CI 77491 (Iron Oxides), CI 77492 (Iron Oxides), CI 77499 (Iron Oxides), CI 15850 (Red 7 Lake), CI 42090 (Blue 1 Lake), CI 45410 (Red 28 Lake), CI 19140 (Yellow 5 Lake).